I’ve been learning all about employee advocacy benefits since I joined Tribal Impact a few months ago and whilst I had an appreciation of what employee advocacy was, I’ve been amazed at just how many benefits, both soft and hard, there are. Having spent most of my career in a Commercial role, numbers were always a top priority and when working with my Marketing colleagues, I’d always want to know what the ROI was, particularly if you were talking about a new initiative such as, employee advocacy. We all know that time is money and if you can’t back up your claims of why it’s worth investing in a program then the chances are you won’t be getting that investment. Since switching to the ‘other side’ I’ve come to realise that although social media is classed as ‘marketing’ it really is a world that bridges marketing and sales (smarketing is the keyword here!) because the ROI of employee advocacy is truly measurable. Traditional marketing always had the challenge of trying to prove their spend delivered results but as John Wanamaker is credited as saying “Half the money I spend on advertising is wasted; the trouble is I don't know which half”. The value of the digital world is that buyer journeys can be measuring and directly attributed to results if you have the right tools, Hubspot is our go-to tool for tracking end-to-end attribution. Yes, that’s right, high performing firms with a formal employee advocacy program grow faster than those who don’t have one. Those with a formal employee advocacy program also reported many other benefits including shortening the sales cycle, attracting new business and generating new revenue (via social selling). This is something that’s widely talked about within employee advocacy but what I don’t hear so much is some of the less direct benefits (there are more detailed in the study, I’ve just captured a few). Improved customer service (employees will often assist or resolve customer complaints autonomously). A reduction in marketing costs (for example, calculate your cost per click saved from shared employee articles v. paid platforms). I wonder how many companies track these kinds of ‘indirect’ employee advocacy benefits; I suspect many are focused only on lead generation and conversion without realising that employee advocacy can affect many different departments and processes which contribute straight to the profit line. This is why it is critical to approach employee advocacy across the business - it truly is a strategic program that benefits the whole enterprise and it’s absolutely imperative that departments work together and see the virtuous circle that can be achieved. 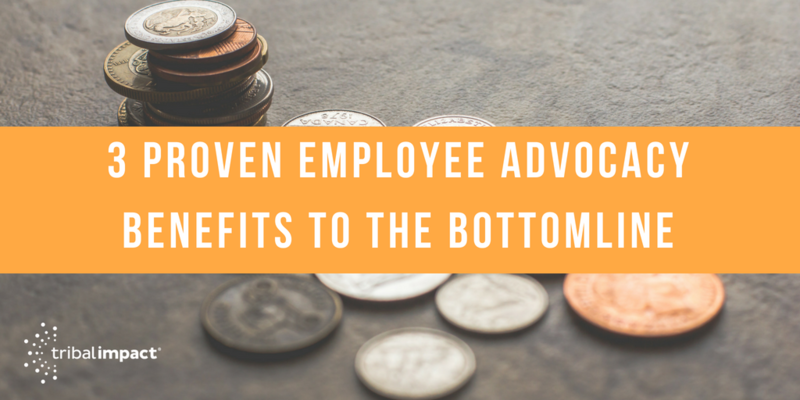 Last but most certainly not least, employee advocacy benefits the employee themselves. Here however, tread carefully; as good as an employee advocacy program sounds, it should never be mandatory as it only ends up on a ‘have to do’ list which somehow never gets done. How to get employees on board is a whole other blog but, in the meantime, if you’re interested in developing your own Employee Advocacy program, download our free employee advocacy workbook that will help structure your framework in 8 easy steps.